Smartlaunch has three different aspects of security available at the Smartlaunch Client. Control program behavior of different Microsoft programs such as Windows, Messenger and Internet Explorer. Make applications filters to revent users from launching certain games or programs. Define what drives on the client computers your customers should have access to. 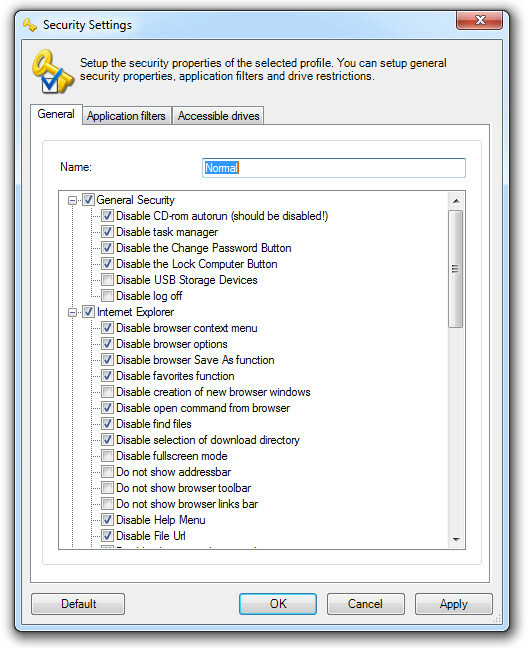 As mentioned, the general security tab has a lot of different security policies, which can disable different functions in some of the central Microsoft products. Smartlaunch includes a security profile called “Default” that contains common security settings. You can Edit this profile and modify it to your liking, or create a new profile by clicking the Add button. The first thing you need to do when creating a new security profile is to choose a name for it. Then you need to select what parts of the different programs which should be disabled. As with the default profile there are some standard functionality already checked, which should give you some basic security at the Client Computers. 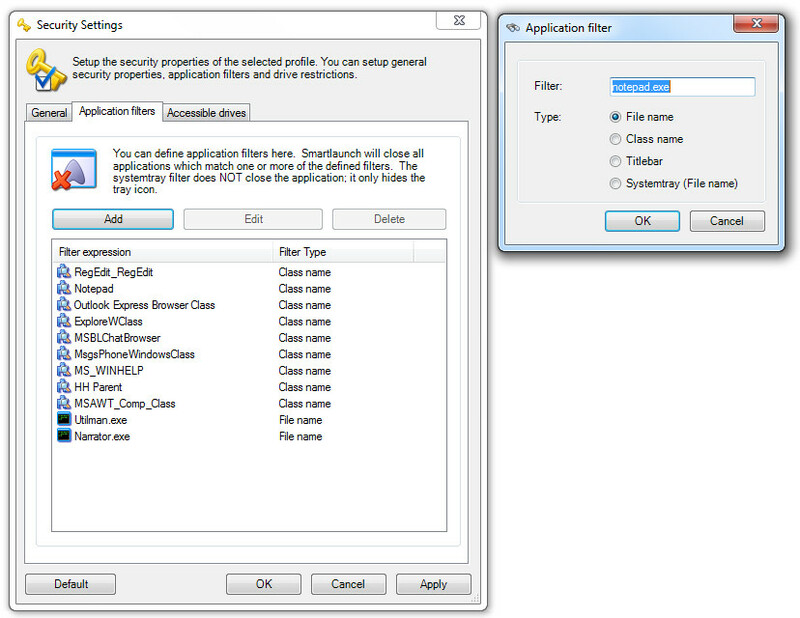 Application filters are special software filters that disallow programs or parts of a program from launching. Click Add New to make a new application filter. In this case we do not want the application notepad to be accessible from a client computer. There are other ways to prevent programs from launching:FilenameThe example we just made was a filename restriction – do not launch a program with an executable with a specific name. Filename should always be in lower case.Class nameThe class name restriction is a bit more complex. Every window, button etc. has a class name in Windows, which means that you can prevent only parts of a program to execute. For instance, you can prevent customers from accessing the preferences in Word or Excel. To locate and find the class name of a program or window you need a third party program. To find the class name of a program or a part of a program we recommend you download the following program: http://www.codeproject.com/system/Task_Manager_Extension.aspTitle barClose a program containing a specific title.System traySome programs place icons in the system tray where you can right-click to gain access different parts of the program. To prevent this context menu you need to specify the filename of the program placing an icon in the system tray. It is possible to use all normal wildcards when entering the name. You can find a list of wildcards here. Some of the standard security precautions have already been added. 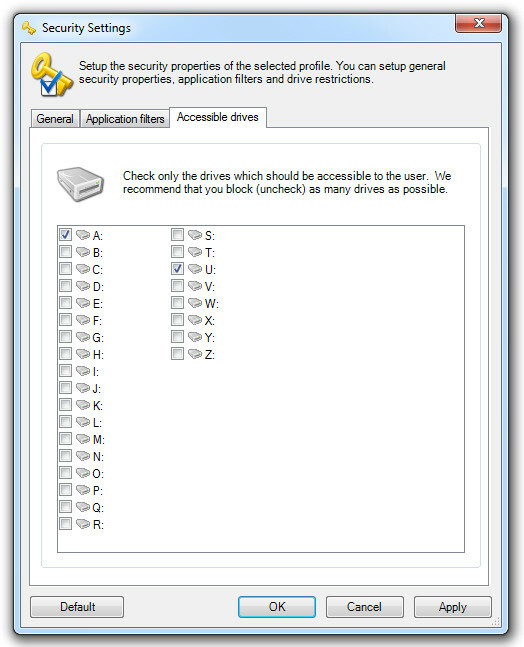 The Accessible Drives tab defines what drives your customers have access to from the client computers. By default, the A: and U: drives are checked. Access to the floppy and document drive (requires the network mapping feature to be enabled) should be allowed.